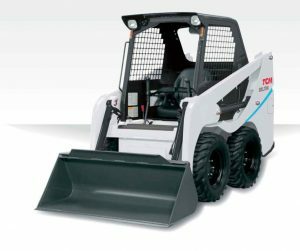 Skid steer loaders used for snow removing, civil engineering, agriculturing and etc. The engines clearing the emission levels required in Japan 3rd Stage regulations, delivering more power with less emission. Has high market share in Japan. Various attachments are available for diverse applications: Utility forks, pallet forks, fork grapple, bucket grapple, wing bucket, light bucket, toothed dirt bucket and digging forks.